I was feeling pleased with myself. At long last, I thought I’d succeeded in identifying why, although I clearly have a passion for plants, my enthusiasm doesn’t look like that of many of my peers in the horticultural world. You’ll have to take my word for it that this epiphany occurred five minutes before I discovered a review for Claudia West and Thomas Rainer’s Planting in a Post Wild World, and not five minutes after. Eventually, in this blog post, I get round to reviewing it myself. Zeitgeist is a funny old thing. For the dedicated follower of fashion, it may bestow feelings of belonging, camaraderie, and even relevance. Meanwhile the philosopher, scientist, artist, or original thinker in any field, it can bite on the bum, as Herbert Spencer would discover when Charles Darwin took the plaudits for the theory of evolution*. For those of us who, like me, fall into none of these categories, it’s simply interesting to see how similar ideas appear to self-engender in several locations, more or less simultaneously, and apparently quite independently of one another. I don’t think of myself as a plantsman. It’s not merely that there's a vast wealth of data that I need to acquire before I could feel remotely justified in thinking of myself in those terms – it’s more that I haven’t the slightest ambition to go about acquiring that information (I’m excluding pelargoniums here – everyone’s allowed a minor obsession or two). And yet it can’t be denied that I love plants. But while I find plants interesting, and from time to time will treat myself to a few new additions for the garden, I’ve no insatiable drive to acquire endless new specimens for my collection. So, while I can appreciate and admire the particular details of an individual plant, for me the magic is in the moment when you put two or more plants together, and – what’s more – it doesn’t matter to me how supposedly ‘garden worthy’ or how humble the plants in question are, the power is in the combination. So a grouping of Cosmos 'Purity', Melianthus major, Cotinus coggygria 'Royal Purple' and Verbena bonariensis, or one of Dipsacus, Rudbeckia, Miscanthus and Delphiniums has the same potential excitement value as a patch patch of weeds that you might find at the base of a wall, or in the bottom of a hedgerow. A less glamorous location, showing how closely plants coexist within naturally occurring communities. Of course there’s nothing new in stating that planting combinations are key to making a garden zing. Good gardeners and designers understand this on an instinctive level, but many – very many – don’t. Even at the RHS shows, you’ll see blocks of monolithic planting, which is all well and good on the rare occasions where some kind of brutalist notion underpins the design concept. But all too often we see the clean contemporary lines of the hard landscaping paired with a kind of faux-minimalist design (I’ve referred to it as ‘plastic planting’ before), which bears little resemblance to true minimalism; not when you think of the music of Steve Reich or John Adams, where one constantly repeated phrase gradually meshes with another, continually shifting in and out of phase with one another, and creating new patterns all the while. This is what plants do, and do naturally. Which brings me – and not before time – to the Planting in a Post-Wild World, by Thomas Rainer and Claudia West. Why should we want to transform our planting? 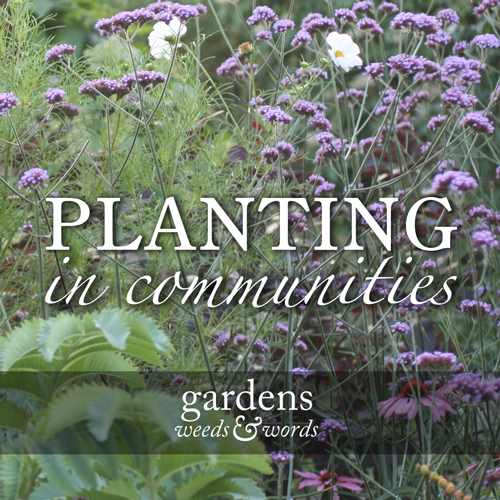 Because, it is argued, so much of the way we go about the business of gardening now is both time and resource hungry – we plant individual, or small groups of plants, surrounded by bare soil, mulched to keep down competing plants (weeds), in soils which we continually seek to improve by the addition of fertilizers and conditioners. Rainer and West point towards a planting of the future, characterised by a variety of species interweaving to form dense carpets of vegetation, a lack of bare soil, and evidence of a number of different ways in which plants adapt to their site, resulting in more robust, harmonious and diverse plantings which, critically, require less maintenance. Further environmental benefits, such as greater biodiversity, and increased potential for carbon capture and rainwater sequestering are both implicit and clear to see. The authors call time on the sloppy thinking and cognitive dissonance evident in our simultaneous preaching of ‘right plant, right place’ while advocating large scale soil amelioration and mulching regimes. The notion of plant communities, defined as ‘related populations, not isolated individuals’, and the dynamics which operate within them over time and space, is central to the book’s premise, the repetition of the phrase becoming almost mantra-like over the first few chapters. But the scope of the book is greater than merely posing the questions and suggesting a new ideology: this is a practical volume whose chapters lead us on a journey, first setting the scene, then establishing some basic principles before detailing the phases of design, implementation and management (rather than maintenance). This book articulates an optimism about the opportunities presented to gardeners and designers by our increasingly built-on landscape. Rather than become paralysed by mourning for what we have lost – and without deprecating the sincere and heartflelt grief we feel at the irreversible destruction of so much of our natural inheritance, the text assumes a forward-looking stance, and paints a picture in which the best of our efforts will see us working in partnership with nature in designing environments which are at once sustainable and full of meaning for all who interact with them. It’s planting, Jim. But not as we know it. * Spencer’s own concept of evolution was published in 1857, predating On the Origin of Species by two years. He even coined the phrase ‘survival of the fittest’ in a comment upon the latter’s work, but today his renown has been eclipsed by Darwin.